I see more and more summer perfume releases described as “solar florals”. Well, Terracotta Le Parfum is a fragrance that really does fit that description. The white florals are dewy but the gentle warmth of vanilla increasingly shines through. It was first released in the summer of 2014 to celebrate the 30th anniversary of Guerlain’s popular Terracotta collection of bronzing products. It was a big hit, so happily it has not only been re-released this summer, but has joined the permanent line. The composition is by in-house perfumer Thierry Wasser and features accords of bergamot, coconut, tiare flower, jasmine, ylang-ylang, orange blossom, musk and vanilla. 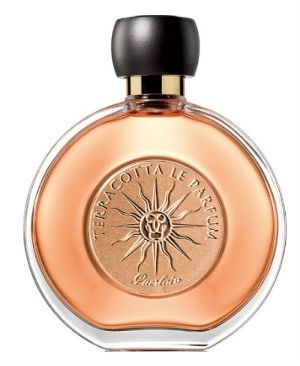 Terracotta Le Parfum definitely has an air of elegance but doesn’t take itself too seriously. It feels carefree, as if it’s caught a jet to warmer climes and left its usual fast-paced life far behind. The Terracotta Le Parfum woman is super chic and gets her golden glow from cosmetics only. She chooses to vacation in style, perhaps on a yacht off the shore of the British Virgin Islands. She accessorises her designer bikini with bold but tasteful jewellery. There’s no point comparing Terracotta Le Parfum to Guerlain’s main collection. This is an entirely different, dressed down affair. What’s so very Guerlain about it though – apart from the vanilla – is that it’s incredibly well blended. Lush white florals swirl in coconut water, while the airy vanilla fills it out and gives it substance. The subtlety of the coconut means that it doesn’t scream sun-tan lotion; it merely nods in that direction. The opening is tiare accented with the citrus of bergamot. As it develops I get some other florals, mostly orange blossom, but the tiare continues to dominate. 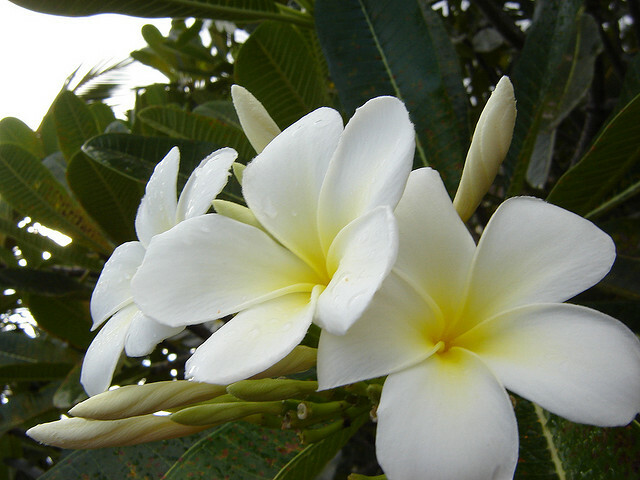 Terracotta Le Parfum really is all about that tropical white flower. It’s smooth and shot through with freshness to the point of being almost aqueous. There’s something windswept and billowy about it. I see big blousy tiare flowers swaying in the ocean breeze. The base is all about lightweight vanilla and a smattering of coconut. It eschews the oily feel of some beach-y perfumes and therefore it doesn’t have that almost trashy vibe. Not that I dislike that effect by any means, but this is a Guerlain after all – a little class, if you please. For this reason, you’d be more than comfortable wearing Terracotta Le Parfum to your office in the midst of the city. It doesn’t have its toes completely submerged in the sand. In terms of sillage, I would say it’s rather quiet, but I find the lasting power to be very good. Even if it wasn’t, I don’t think you should expect serious commitment from a holiday romance. Have you had a summer fling with Terracotta Le Parfum? This entry was posted in Fragrance Reviews and tagged Fragrance, Perfume, Review. Bookmark the permalink. In a nutshell it said, “I love the solar, floral, tropical, beachy scents” and that you picked one I love too. I’m so sorry about that Portia but thanks for trying again. I can imagine beachy, solar florals suiting you brilliantly. This is a classy one. I need to look through my perfume collection a bit better. I hope you can find Asali’s decant, Ines. I have so many decants/samples in so many places I have absolutely the same problem. This one isn’t too heavy so it could work really well in Vienna’s heat. I hope you can find it now it’s been re-released. It’s great Guerlain brought out a sophisticated beach scent for Guerlie Girls like you, Asali 🙂 Definitely no white musk hell! Lys Soleia is another one that is truly a solar floral. I think you are closer to the Terracotta lady than you realise! I usually don’t use or test mainstream perfumes, only niche and some selectives but this one is so wonderful. I am seriously thinking about getting it. Its really careless, a bit sweet (I like my white flowers on a sweet side) and light (no suffocation please). Polinia, I totally agree. I’m really not good with big white florals but this is light and airy. It isn’t suffocating at all. this was an absolute favourite of mine last year! beach and holiday and tropical flowers in a bottle! the LE blush&bronzer palette from the same collection had the same scent! which is amazing! How interesting that the LE palette had the same scent. What a clever, fun idea. This is the kind of frag you could end up wearing all summer long. Ooh Suzanne, you go to ballroom dancing classes? How cool. I love Strictly Come Dancing (the UK version of Dancing with the Stars). The Argentine Tango is my fave. Your friend sounds lovely inside and out. It’s excellent news that Terracotte le Parfum has been made permanent. Too many times these fab LEs are lost forever. Hi Tara! Lovely review. I enjoyed Terracotta Le Parfume so much I purchased a bottle – was just before it was re-released, although I’m happy to see it back on the shelves. Can wear it with abandon now! 🙂 the tiare is lovely, and it has a great warm tropical vibe. So fun. Tina, I think it was a good idea to go full bottle on this considering you have the weather for it most of the year. Thanks for taking time out after all your travelling to comment, V.
I still prefer the oilier Nuxe but this is great for those who like more of an airy floral. I’ll send you some with your package. It is more in the Bronze Goddess vein. Too bad about the Hermes. I tried it last year. I liked it but since the main reason of trying it was to figure out if I needed to jump through some hoops to get the last unsold bottle of it, I quickly decided that it wasn’t that special and moved on. Now, when there’s no pressure, I plan to re-visit it to see if it needs to join my all-time beach favorite Bronze Goddess.